Most motorcyclists have a checklist they go through every time they head out. Pre-ride inspections usually involve making sure the bike is generally in good working order, the portable GPS is queued up, and they have all of the proper gear, such as helmets and extra gloves. There is often a double-check of road conditions and weather reports. It typically doesn’t involve a check of the lunar calendar. Maybe it should, since it might affect the chance of an Indiana motorcycle accident. A new study published in the journal The BMJ (a weekly, peer-reviewed medical journal) concluded fatal crashes are more likely under a full moon. Why might this be? Police, emergency room workers, and others routinely working night shifts often lament the “full moon madness,” insisting it is a real issue, and every time the moon was full, emergency departments and booking stations would be packed. But there hasn’t been a lot of independent data to back that. A 2011 study published in the World Journal of Surgery found that while 40 percent of staff believed lunar phases affect human behavior, most research found no solid correlation. In the most recent analysis specifically pertaining to motorcycle accidents, study authors determined the risk of a fatal motorcycle accident in the U.S. was 5 percent higher on nights with a full moon compared to nights without it. When the moon was a so-called “supermoon,” the risk of a deadly motorcycle crash shot up by 32 percent. Specifically, on the 494 full moons and 65 supermoons between 1975 and 2014, there were 4,994 fatal crashes, which averaged about 9.1 deadly crashes on each of those nights. On nights with a supermoon, it was nearly 11 nightly fatalities on motorcycles. To compare, the average number of fatal crashes on nights without a full moon was about 8.6. Over the course of the entire study period, that amounted to more than 225 additional deadly motorcycle accidents on nights with full moons. The full moon is a distraction for motorists. The moon alters the lighting of surrounding landscapes, resulting in all motorists misjudging speed and distance. Our attorneys know nobody is pursuing civil liability against the moon, of course, but researchers say it does allow us to draw two important conclusions. Firstly, motorcyclists in particular should exercise great caution any time they are riding at night (crashes are more likely at night in general), but especially during a full moon. Secondly, if something as seemingly benign as a difference in moon lighting can affect motorcycle crash rates, other factors – like texting and impaired driving – deserve even more of our attention. Indiana’s distracted driving law, IC 9-21-8-59, prohibits the use of a telecommunications device while operating a moving motor vehicle unless the device is hands-free or being used to report an emergency. It’s generally not so much an issue for motorcyclists, given the physical requirements of operating a motorcycle, but those on bikes do tend to face out-sized risks when other drivers do it. Inattentional blindness (a phenomenon wherein drivers will “miss” a smaller vehicle like a motorcycle or bicycle simply because they aren’t looking for it or are distracted by their own thoughts) already has these vulnerable road users in greater peril as it is. Violation of this – or any – law isn’t necessarily conclusive proof of liability in a motorcycle accident, but it can be used as evidence to establish negligence in a personal injury or wrongful death case. 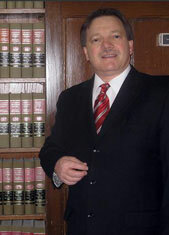 Indiana Injury Attorney Burton A. Padove handles personal injury claims throughout northern Indiana, including Highland, Gary and Hammond. Call Toll Free 877-446-5294.